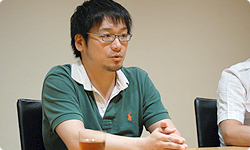 About when did you finalise the operability of the controller and solidify the game specifications? Just before the Tokyo Game Show4 one year ago. 4Tokyo Game Show 2008: A trade show held in October 2008 at Makuhari Messe focusing on video games and other fields in computer entertainment. A playable version of Monster Hunter Tri was presented then, right? That’s right. I made a ROM for the presentation. Even when people were telling me I had better burn it soon or I wouldn’t finish on time, I was still playing around with it. (laughs) I was like, “I want this to be just a little more like so,” and, “Let me work a little harder here.” I wrestled with it, changing game operation, up until the last minute. 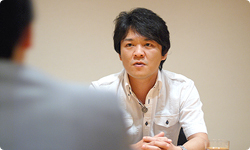 With regard to game operation, we had a policy of not announcing anything until the Tokyo Game Show. Even if we were asked about it in an interview, we wouldn’t answer. That was because rather than convey it through words, we wanted to have people actually try it out and hear how they felt. When we did, we heard what we had wanted to hear more than anything else. “I’m relieved.” That’s what everyone said. That was a big relief. Our unease over how to play the game with the Wii Remote finally disappeared. The fans at the Tokyo Game Show really went wild over it. It was almost scary! (laughs) First thing in the morning, I saw hordes of fans rushing towards the Capcom booth. I thought, “You’ll still get to play even if you just walk slowly,” but I was extremely happy that they came. 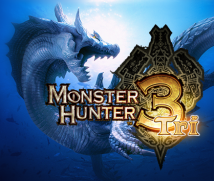 A lot of people said Monster Hunter Tri was the biggest attraction at the game show, but I think there are still a lot of gamers who have heard the name but never tried it. Could you explain a little about what elements of Tri you designed for those people? the screen is split in two , and two players can simultaneously enjoy hunting together. That way people who don’t know how to play can play together with someone who does and learn the basic actions. 5The Arena: One of the game modes of Monster Hunter Tri. It is designed for one or two players to easily enjoy co-op gameplay. Special stages offer a variety of challenges. So first you’re initiated by someone close to you, and then you enter the online world. That’s right. I remember playing Super Mario Bros. on the NES with my friends when I was a kid. There were times when I stood behind one of my friends, watching him play and learning the right actions to take. Right. That’s why we made the game so that when someone thinks, “That looks fun,” they can split the screen in two, and if they have two controllers, start playing right away. There’s no need to jump right into online play. First you can play offline with the screen divided in two with your friends or family. Then you can go online. I think splitting the screen is pretty common for Nintendo titles. Yes, we’ve done it a lot for Super Mario Kart and such games since the days of the Super NES. But until now we never had that idea for the Monster Hunter series. But this time, along with bringing it out for Wii, we decided to try splitting the screen for the first time. Because of the characteristics of the Wii hardware, the console is generally placed in the living room. So we wanted to create an environment that an entire family could enjoy. I think the effects of players recommending a game to those close to them are huge. Word-of-mouth publicity occurs across generations within the home. It may be the only place for that. Yes. A mother may start playing because of the influence of her child. We’ve seen such occurrences a lot with the handheld series. Dividing the screen is perhaps the most important aspect of the game that we included for those who have never played this series before. It will be incredibly interesting to see how the game spreads. It’s the first time we have tried it too, so we are really looking forward to seeing the results. Something else we’re trying for the first time is storing data in the Wii Remote so you can carry it around with you. And take it with you to a friend’s house. You take them home with you. It’s hard to imagine what will happen. We’ll have to wait and see. We can’t imagine what will happen, but I think it’s something interesting we could try precisely because the game is for Wii. Going back to the NES days again, when I was a kid, I really liked going over to a friend’s house to play videogames. I think it would be great if the Wii Remote encourages that.